Temperatures are currently in the 50s in many places around the region. This will not last long, as a cold front approaching from the west will cool us down. Temperatures will be in the upper 30s until the end of the week. 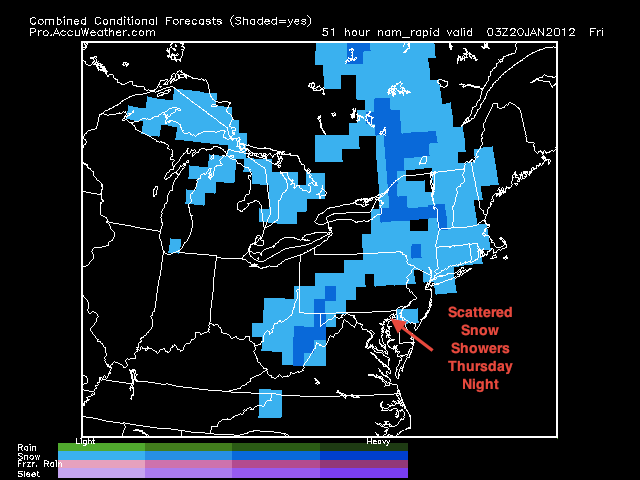 On Thursday Night, there is a chance for a few scattered snow showers to fall. They will not accumulate too much, but will be localized. As a result, the Friday morning commute in some places could be a little dicey. A storm system will affect the area Friday Night into Saturday. This storm will be riding a primarily flat jet, and will not strengthen into a major nor’easter. Like most of the storms this winter, the question that remains is how much cold air will be available during the storm. The European shows some snow (1-3 inches) for the area Saturday Morning. The GFS, however, is warmer aloft and keeps the precip as primarily rain. Right now, I am leaning toward the GFS solution. The NAO is going positive (again), and the cold air just won’t be in abundance. I’m sorry to say it, but this winter so far has been about the lack of cold air aloft. There is some good news, however. The NAO is projected to sink by the end of January, and the AO (Arctic Oscillation) will also be negative. Both of these teleconnections being negative are good signs for an active February. Next week there is a chance of another storm, but rain is looking to be the primary precipitation.